So many slighting remarks have been made of late on the use of teaching grammar as compared with teaching science, that it is plain the fact has been lost sight of that grammar is itself a science. The object we have, or should have, in teaching science, is not to fill a child's mind with a vast number of facts that may or may not prove useful to him hereafter, but to draw out and exercise his powers of observation, and to show him how to make use of what he observes.... And here the teacher of grammar has a great advantage over the teacher of other sciences, in that the facts he has to call attention to lie ready at hand for every pupil to observe without the use of apparatus of any kind while the use of them also lies within the personal experience of every one.—Dr Richard Morris. The proper study of a language is an intellectual discipline of the highest order. If I except discussions on the comparative merits of Popery and Protestantism, English grammar was the most important discipline of my boyhood.—John Tyndall. (1) It makes rules to tell us how to use words. The older idea and its origin. Fierce discussions have raged over these opinions, and numerous works have been written to uphold the theories. The first of them remained popular for a very long time. It originated from the etymology of the word grammar (Greek gramma, writing, a letter), and from an effort to build up a treatise on English grammar by using classical grammar as a model. Perhaps a combination of (1) and (3) has been still more popular, though there has been vastly more classification than there are forms. During recent years, (2) and (4) have been gaining ground, but they have had hard work to displace the older and more popular theories. It is insisted by many that the student's time should be used in studying general literature, and thus learning the fluent and correct use of his mother tongue. It is also insisted that the study and discussion of forms and inflections is an inexcusable imitation of classical treatises. Which view shall the student of English accept? Before this is answered, we should decide whether some one of the above theories must be taken as the right one, and the rest disregarded. The real reason for the diversity of views is a confusion of two distinct things,—what the definition of grammar should be, and what the purpose of grammar should be. 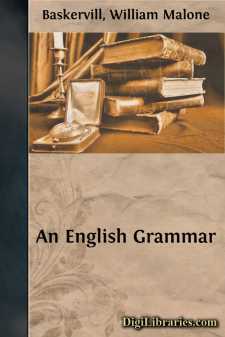 The province of English grammar is, rightly considered, wider than is indicated by any one of the above definitions; and the student ought to have a clear idea of the ground to be covered. It must be admitted that the language has very few inflections at present, as compared with Latin or Greek; so that a small grammar will hold them all.